The Apache attack helicopter or AH-64 Apache is a four-blade, twin-engine attack helicopter made by Boeing that is designed for a two man crew. The Apache helicopter was originally developed to replace the US Army’s' AH-1 Cobra. First introduced in 1975, the AH-64 has high tech sensors for target acquisition and night vision capabilities, it is armor plated and heavily armed. The AH-64 also has the ability to fly at extremely low altitudes, making it ideal for stealth operations and evading detection. The Apache remains in service to this day and is regarded as one of the most effective offensive aircraft in the world. Apache helicopters have a loyal following among the military and military aircraft enthusiasts. 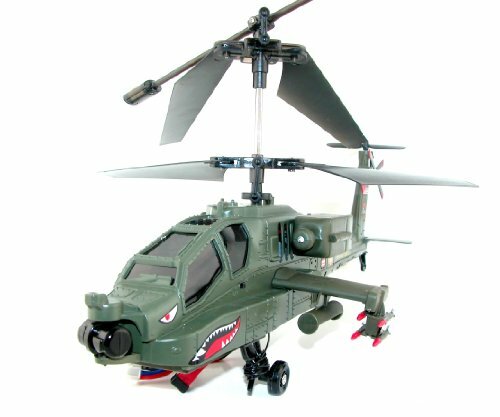 There are websites dedicated to the Apache helicopter and remoted controlled or RC Apache helicopters available as well. The Apache was the first helicopter designed to withstand heavy attacks and also possessed precision that was unparalleled at that time. Able to seek and destroy targets day or night even under adverse weather conditions the AH-64 has become one of the most often used offensive helicopters by the strongest military powers in the world. The Apache attack helicopter is currently used by the United States Armed Forces, Great Britain, Japan and Israel among others. Apaches have played key roles in both Gulf wars, Afghanistan, during the conflict in Bosnia and Kosovo and numerous other conflicts. Apache helicopters are heavily armored and are renowned for their ability to sustain heavy damage while continuing to carry out their missions using their chain guns and hellfire missile weaponry and then safely return to their base. Although the Apache was first flown in 1975 it still remains a highly effective attack platform and a formidable weapon in the US aresenal. It has received numerous upgrades over the years in radar, communication systems, engine redesigns and armaments allowing it to remain a state of the art attack aircraft. The Apache attack helicopter remains today the most flexible of all military aircraft with it's reconfigurable hellfire missiles, auxilary fuel tanks and numerous other upgrades and accesssories and is uncontested in its three dimensional maneuverability. Able to approach targets from any direction, it is a formidable adversary. Apache helicopter pilots are highly trained to fly these expensive and high tech aircraft and require a high degree of concentration to manage decision making in all three dimensions, particularly while piloting the Apache attack helicopter engaged in combat. While you may never have the chance to fly an actual Apache combat helicopter yourself or even be a passenger in one, you indulge in your passion for the flying tank with remote controlled replica. 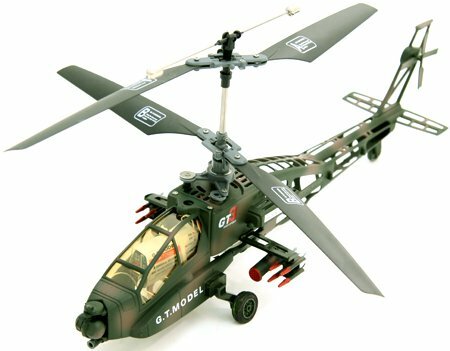 These RC Apache helicopters are great fun to fly and simulate the adventure of flight. Several models from Amazon are pictured below. More details and specs can be found on the Amazon site.